Mendelson's Memos: Review: Snitch (2013) is a potent political diatribe disguised as a solid B-movie action drama. 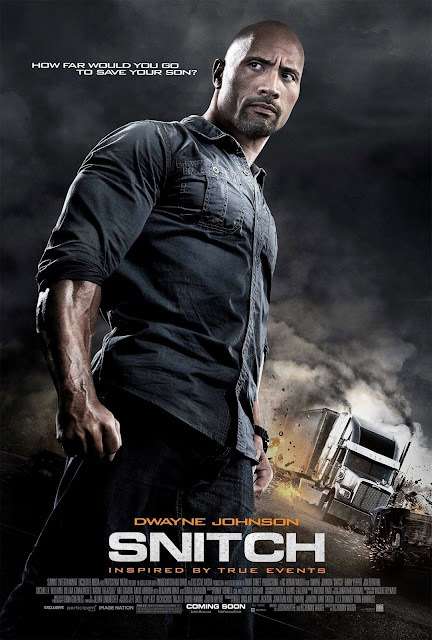 Review: Snitch (2013) is a potent political diatribe disguised as a solid B-movie action drama. Writer/director Ric Roman Waugh and writer Justin Haythe's Snitch (trailer) operates on two levels. On one hand, it's a pulpy and satisfying B-movie, a distinctly old-fashioned studio programmer about a normal man thrust into an abnormal situation. The film is compelling and engaging, keeping its head to the ground in terms of plausibility and authenticity. Even when the film chooses action, the action beats are small-scale and life-sized, which in turn makes them more suspenseful. But the film also operates on a second level, that of a somewhat angry political polemic. While the film doesn't go all-in in condemning the entire 'war on drugs', it sticks to a specific portion of that misguided policy and makes an unimpeachable case for its stupidity. The film thus earns bonus points for being able to successfully mix social moralizing with its action drama while sacrificing little in the way of story or character. The picture involves Dwayne Johnson as a family man who agrees to go undercover to snag drug dealers in order to save his son from a lengthy prison sentence. His son is yet another victim of mandatory-minimum drug sentencing laws, and the film makes no bones about criticizing their use and counter-intuitiveness. The film's overall case is basically that the mandatory minimum sentencing laws may have been intended to snag upper-level drug dealers and/or kingpins, but their inadvertent result is merely the long-term incarceration of first-time offenders (since they have no one to testify against) and the mass entrapment of otherwise law-abiding people in desperate attempts to reduce the sentences of the initially arrested newbies. For those completely unfamiliar with this situation, the film lays it out in stark terms, even as it flirts with 'book report-itis' in the first act. And even as John Matthews gets further into the drug scene, the film never forgets that the system has basically made an innocent man into a drug dealer. While Dwayne Johnson is on the poster, the film gives nearly equal time and arguably even more sympathy to Daniel James (Jon Bernthal), a two-time offender trying to stay straight for his family, nonetheless used as a pawn of sorts by his desperate boss. Johnson's Jason Matthews may have the protection of the authorities he is aiding, but Daniel is the one who is basically bullied by his own boss into reentering a world he has sworn off. And while we're mostly sure that The Rock isn't going to die at least until perhaps the finale, Daniel and his family is fair game at every moment, giving the film an extra level of tension. We feel for a seemingly good man genuinely trying to put his life back in order for the sake of his wife and daughter, and we feel genuine discomfort as the would-be hero of the film basically forces one of his low-level employees to return to the criminal scene that he was sworn to cast aside. The film is mostly well acted, even if the women in Jason's life (Melina Kanakaredes as his ex-wife and Nadine Velazquez as his current wife) get little to do other than worry and fret. Susan Sarandon flirts with mustache-twirling, as an uncompromising prosecutor using her 'get tough on drugs' stance to enter politics, but we all know such people exist in the world of law enforcement. Jon Bernthal all-but steals the film from a perfectly solid Dwayne Johnson, and Barry Pepper delivers a solid shades-of-gray turn as a seemingly sympathetic cop who nonetheless makes calls that arguably serve the greater good. Michael Kenneth Williams and Benjamin Bratt represent the drug trade and are better than the material they are given. Although since the film is not about them per-se, they only represent to us what they represent to our would-be "heroes". Snitch presents a brutally cynical scenario, where one stupid kid is forced to basically frame another stupid kid for penny-ante drug dealing which in turn forces a respected businessman to flirt with financial ruin and/or very real violence in order to get his son out of trouble. The picture never paints Jason's actions as remotely heroic, and the film almost qualifies as a present-tense film noir. Time will tell if Snitch will have the ability to change any minds or at least open any eyes to what really is a national travesty. But surely its status as a mainstream action picture makes it more likely to reach more unconverted viewers than a documentary like The House I Live In (review), critically acclaimed but seen by few but film/culture critics and staunch anti-prohibition advocates. As a movie divorced from its politics, it is a compelling and thoughtful drama, with just enough action to put in a trailer but really more concerned with character then set-pieces. I could quibble with the ending, which somewhat ignores the larger implications of what occurs, but that's a minor nitpick. As a vessel for social change, Snitch is an unlikely but inherently plausible vehicle. As a movie, it's the kind of old-school star-driven studio programmer that used to be the industry's stock-and-trade. It doesn't quite qualify as art, but it's (um...) rock-solid craft that wears its worthwhile social conscience on its sleeve. Review: Stoker (2013) delivers the gothic goods. Review: A Good Day to Die Hard (2013) dies badly.